Opencart Abandoned Cart : Opencart Abandoned Cart module is a beneficial module for the Store owner. With the help of this module, they can view the customer(s) who had abandoned the shopping cart in the mid-way. The store owner or the admin can notify the customer(s) about their abandoned cart. This wonderful module is a powerful tool for the admin to increase the sales and revenue of their Opencart Store. Admin or the store owner can notify the customer(s) manually or automatically by setting cron job on the cPanel. Opencart Abandoned Cart: Opencart Abandoned Cart module is a beneficial module for the Store owner. With the help of this module, they can view the customer(s) who had abandoned the shopping cart in the mid-way. The store owner or the admin can notify the customer(s) about their abandoned cart. This wonderful module is a powerful tool for the admin to increase the sales and revenue of their Opencart Store. Admin or the store owner can notify the customer(s) manually or automatically by setting cron job on the cPanel. Admin can set the email template for sending emails to the customers. Admin can enter the email address through which notification message will be sent to the customer(s) for the abandoned cart. Admin can view details of the customers like their name, email id, IP Address, Time & Date. Admin can notify the customers manually or automatically. 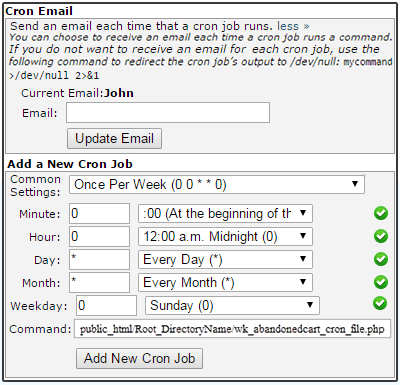 Admin will set up Cron job for sending the notification for the abandoned cart automatically. The codes are open source and it can be customized as per your requirement. Admin will enter the admin or default email address from where the mails will go to the customers. Admin will enable the email notification for the same. In the admin's end, there is a tab called Abandoned Cart, where the admin will see the list of customers who had abandoned the shopping cart in the mid-way. In the list of customer, admin will see details like name, email address, IP address, date and time. Admin can manually notify the customers by clicking on “Notify” button. Admin can also sent abandoned cart mails automatically. Admin will set up the cron job from the cPanel. Now admin will select the time in which cron job will start. Admin will also enter the path of the command which will be used to run the cron job. Admin will set up the cron job from the cPanel. Admin will select the time in which cron job will start. Admin will also enter the path of the command which will be used to run the cron job. Did you buy Opencart Abandoned Cart?